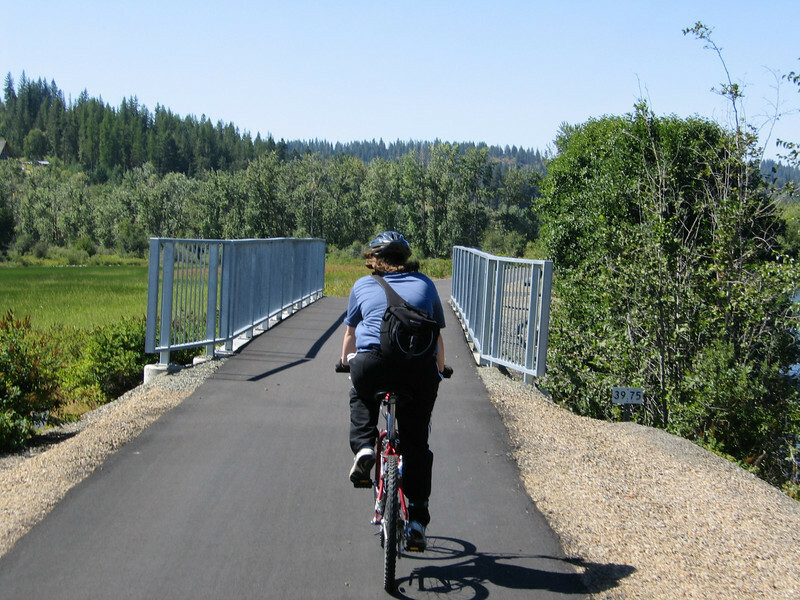 The Trail of the Coeur d'Alenes is a magnificent 72-mile trail, one of the longest continuously paved rail-trails in the country. The trail follows the Union Pacific Railroad's right-of-way from Mullan, a mountain mining town near the Montana border, through the Silver Valley, into the chain lakes region, over a 3,100-foot bridge to Heyburn State Park and then on to the Coeur d'Alene Indian Reservation, ending in Plummer near the Washington border. Interpretive signs along the way tell the story of the region's rich history. Numerous trailheads, restroom facilities, picnic tables and benches dot the length of the trail. This enormous effort, costing nearly $50 million, was initiated as a cleanup of historic mining waste and wildlife mitigation. Many cooperating actors were involved because of its nature and extent. Key partners were the Coeur d'Alene Tribe, Union Pacific Railroad, Idaho Parks and Recreation, Idaho Department of Environmental Quality, and the U.S. Environmental Protection Agency. In 1999, one million dollars in TE funds were used for paving the eastern portion of the trail. The Coeur d'Alene Tribe and Parks and Recreation manage the trail jointly. After transfer of the right-of-way to the trail managers, Union Pacific Railroad will continue to be responsible for some aspects of trail maintenance.